For your information the owner of your blazer was a Capt T.E.G.Nugent who won an M.C. (Military Cross) whilst serving with the Irish Guards in the First World War. He played for the Eton XI cricket team in 1913. The stripes of his blazer do not appear to have been an Eton colour, or indeed his house colour whilst there. 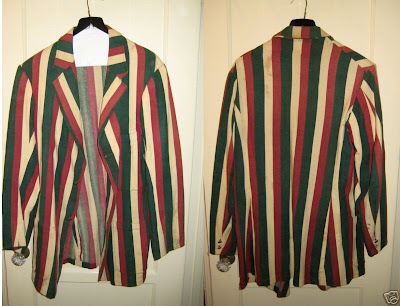 I suspect that this is an Irish Guards cricket blazer which Capt Nugent got Devereux to knock up for him. I am the lucky owner of a similar jacket from the 1920s, but in milk chocolate brown wool with same color grosgrain ribbon piping that belonged to my grandfather. Has a crest on it with the initials "OMHRFC" that stands for Old Mill Hillian Rugby Football Club. Mill Hill is a second tier boys "public" school in London that my grandfather attended. Interestingly, according to the note written (in fountain pen ink) by my grandmother on a card in one of the pockets, my grandfather did not actually play rugby while at Mill Hill, but whatever! I found the jacket among other sartorial treasures while going through his clothes after he died (in his 90s), tried it on and la, it fit! He was a clothes horse and kept almost everything, including his track shoes used while on the cross country team at Williams College, class of 1912. Although somewhat fragile (no sudden movements please) I wear the jacket a couple times a year; its perfect for an evening at home paired with flannels, Belgians, and a rep tie used as a belt.